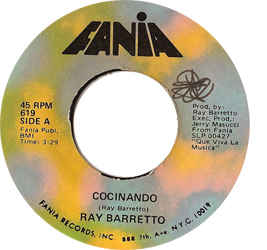 Ray Barretto was one of the most dynamic members of the Fania All Stars. One of the most skilled musicians of the group, it was no doubt due to his work on the scene before he signing to the famous Latin label. Most people who only know him for his work on Fania think he was a salsa musician. But Barretto was a jazz musician first, as it was the sounds of Dizzy Gillespie and Chano Pozo that inspired him to pick up the congas. In his early career Barretto was a session player at Blue Note, Prestige, and Riverside and as a result many of Barretto’s early solo productions have the markings of jazz compositions. But has we moved on to work with Fania, his compositions took a much more soulful feel. This would make Barretto crucuial to Fania as the lable moved to defined the sound of the salsa generation. This track from 1972 is Barretto at his best, capturing the slick, cool, laid-back feel of life in Spanish Harlem’s ghettos. The track was featured on Our Latin Thing, an excellent film about Fania Records and Spanish Harlem during the 1970′s by legendary film maker Leon Gast. A perfect track to ride out the summer. Este por mi barrio.